Ernesto Valverde believes Barcelona can inflict a hefty blow to Real Madrid's morale by winning a second Clasico in four days on Saturday. Barca knocked Madrid out of the Copa del Rey with a 3-0 victory at the Santiago Bernabeu on Wednesday and will go 12 points clear of their opponents in La Liga if they can repeat the result this weekend. "It is very difficult in two consecutive matches against the same team to get the same result," Valverde said on Friday. "We want to go for the win because it would be an important blow to their morale for the remaining matches. It would also take points off Madrid, who are a direct rival to us. "We know it won't be easy. The other day, despite the result, we saw the difficulty of playing there. "But when one team wins, it is true that what they gain is confidence and the team that loses wants another match as soon as possible to make amends. That is how both teams are at this point." 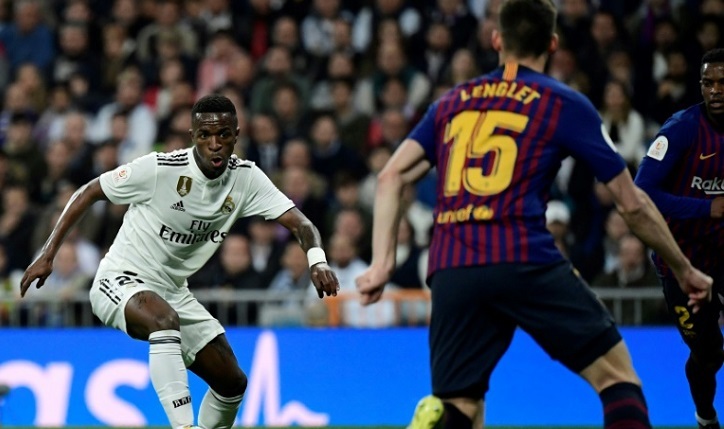 Madrid, with Vinicius Junior particularly dangerous down the left, created a handful of excellent chances on Wednesday before Barca scored three in the second half. Asked if he had a special plan to contain Vinicius, Valverde said: "We have a special plan and that is that we have to do it together. He is unpredictable and the other day we had problems. We have to be wary of him, that is obvious." Vinicius' form has made it harder for Gareth Bale to get in the team but Santiago Solari insisted on Friday that the Welshman is still a key player for Real Madrid. Bale has been a substitute in seven of Madrid's last nine games and his place in the side on Saturday is not guaranteed, after starting on the bench again in midweek. Asked about the importance of players like Bale, Solari said: "They are still important, titles are won by whole squads. Bale has played in every game since returning from injury and he is scoring goals. He did it in the Club World Cup and in the Champions League final too." There was a scattering of whistles when Bale came on in the semi-final second leg, after a week in which the Welshman had been heavily criticised in the Spanish press. "I have nothing to say to the fans," Solari said. "Everyone knows what Bale can do and they know what he has given to the club. The fans express themselves with great respect." Another win for Barcelona in the Clasico this weekend would all-but end Real Madrid's fading title challenge. "We are back on our feet," said Solari. "We go into this game with all the enthusiasm and spirit of the previous match, trying to improve what we can, and do again what we did well. We must cut the gap." Solari said Isco is available again after he recently recovered from a back injury. The midfielder is yet to start a league game since Solari's appointment as coach.